I’ve been listening to some podcasts on iTunes and came across this song, “Save Me” by Shogun. Since the podcast doesn’t list the musicians for the songs, I went on youtube and found the original version. The original version was okay but I wanted the remixed version. There are quite a few remixes of this song but there was one that I specifically wanted. I eventually found it but there was still something missing. I think I just got hooked on the podcast version. Anyway, I decided to play around with iMovie again and used the podcast version of the song along with an image that I put together using papers and elements from Irene Alexeeva Designs and a fairy from Karen’s Scrap & Graphics. 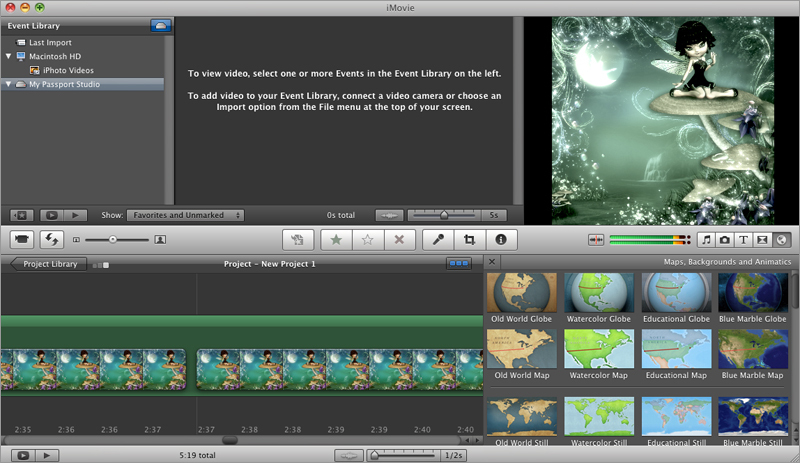 When my Macbook was upgraded a few months back, I didn’t think there would be much change to iMovie, but there was. I was so used to the old version that it was a pain learning the new one. Everything about it was different. Below is the screenshot of the new version. Click on it to view larger. To see what it used to look like, click HERE. The image I used was originally created with Kylie. You can see it here. I just replaced Kylie with a fairy. Hope you like the song as much as I do! Emma Lock’s voice is really what did it for me.